The Israeli Occupation Authorities (IOA) banned over the past month the travel of 130 Palestinians via Karama crossing, the only exit point to the outside world and back for West Bank Palestinians. Palestinian police affirmed Wednesday that 130 Palestinians were prevented from leaving the West Bank from the border crossing of Karama over February under unrevealed security pretexts. The sources pointed out that some 119,000 Palestinians passed through the border crossing last month in both directions. Egypt’s parliament has expelled Mohammed Anwar Sadat, the nephew of the late President Anwar Sadat, on the charge of forging signatures on a draft bill and leaking drafts of the law to foreign embassies. Sadat has denied the accusations and said that the law had already been published online, yet 468 of the 595 MPs in the Egyptian parliament voted to expel him. MPs approved the draft law in November but human rights activists oppose it on the grounds that it will make it impossible for international aid groups to operate in Egypt. The legislation stipulated that the authorities would control their work and their funding. Al-Sisi’s supporters already dominate Egypt’s parliament and the move to oust Sadat, one of the last critical voices, will consolidate this support and weaken opposition to the president. It was believed that Sadat was considering running for president in the elections next year. An illegal Israeli settler murdered on Wednesday evening Palestinian worker inside an illegal Jewish settlement after the latter insisted to get paid, family sources said. The Palestinian health ministry said that it was officially informed that a Palestinian citizen was killed inside and Israeli settlement. It identified the Palestinian victim as Saad Qisiyeh, 24, from the occupied West Bank city of Al-Zahiriyeh, south of Al-Khalil. Family sources said that the Palestinian citizen used to work in the illegal Jewish settlement outpost of Havat Mor built on a stolen Palestinian land in the south of the occupied West Bank. His mother said she knew about Saad’s death before the official Israeli announcement, noting that he called her just minutes before he passed away. “He said that his employer [the murderer] refused to pay him and when he insisted to get paid, the employer aimed his pistol towards Saad and shot him,” she recounted last words of her son. Meanwhile, the Israeli occupation media reported a completely different story about the murder, claiming that the Palestinian citizen had attempted to murder the Israeli settler, who used his pistol in an act of self-defence. The Israeli Ynet News claimed that the Palestinian citizen infiltrated into the illegal outpost with two knives and stabbed the settler in front of his family. Then, the settler ran away, brought his pistol and shot the Palestinian, killing him. Such a narrative exactly similar to the plots of Hollywood movies. As usual, the Israeli officials use the Israeli media to cast false stories to justify the murder of the Palestinians. However, the Israeli occupation media claimed that the Jewish settler murderer was lightly wounded, but they did not show even an image for his wound. Moments ago, Syrian troops entered the western part of Palmyra city and sneaked into several buildings despite coming under heavy fire from ISIS snipers and machine-gun positions. This important breakthrough was facilitated by the liberation of Palmyra Castle and Palmyra Triangle earlier in the day and a series of advances over the past week. Furthermore, the Syrian Arab Army (SAA) advanced north of the city and took control of al-Amiryah village along with the strategic Jabal al-Tar, a mountain overlooking Palmyra city. The SAA also seized several sites southwest of Palmyra earlier today, including the entire mountain known as Jabal Hayyal and the Qatari Palace. However, Al-Masdar News field correspondent Ibrahim Joudeh stressed that SAA units are yet to storm the ancient city over fears that the darkness of night will expose government troops to ISIS suicide bombers and booby traps. However, pro-government tribal fighters and paramilitary fighters have officially entered Palmyra. The final SAA assault is expected to begin on Thursday morning. Leading the offensive is the newly formed 5th Legion, elements of the SAA’s 18th Tank Division, Military Shield Forces, Al-Badia branch, Shaitat tribesmen, National Defence Forces, and a contingent of Hezbollah (Lebanese paramilitary) fighters. ISIS recaptured Palmyra in December, 2016 after between 4,000 and 5,000 jihadist militants overran the city and pushed the SAA all the way back to Tiyas Airbase. Subsequently, Syrian government forces have advanced 50 kilometers eastwards and are now on the verge of retaking the ancient city. Israeli Occupation Forces (IOF) arrested over the past month nearly 405 Palestinians, including dozens of women and children, in the occupied West Bank and the blockaded Gaza Strip, Quds Center for the study of Israeli and Palestinian affairs said Wednesday. 45 Palestinian children and 22 women were among the reported arrests, the center said in its monthly report. 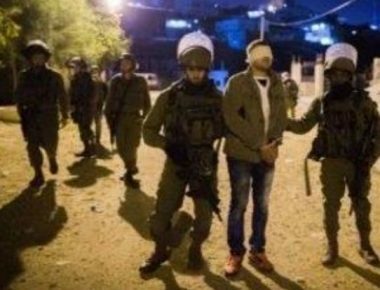 According to the report, the biggest number of arrests was reported in occupied Jerusalem, where 84 Palestinians were taken into custody. Israeli forces also arrested 82 Palestinians from al-Khalil, 63 from Bethlehem, 50 from Ramallah and el-Bireh, 43 from Nablus, 25 from Qalqilia, 16 from Jenin, 9 from Tulkarem, and 6 from each of Tubas and Salfit. During the reported period, Israeli forces arrested 11 Palestinians from the Gaza Strip including five fishermen. The report said some 45 children including a 12-year-old child and 22 women were among the 405 detained citizens in the West Bank and Jerusalem in February. Education Minister and HaBayit HaYehudi Chair Naftali Bennett was in high spirits as he wandered the halls of the Knesset on Feb. 27. In fact, the members of his party noted that he seemed unusually pleased with himself. Just one day before the release of the state comptroller’s report on the performance of the Security Cabinet and the military leadership during the 2014 Operation Protective Edge in Gaza (with much of the report’s content leaked to the press), Bennett could claim an enormous victory. Indeed, the report describes him as the only minister who demanded that Israel take action against the threat posed by Hamas’ terror tunnels. An old rabbinic adage says, “He who works hard before the Sabbath will have what to eat on the Sabbath.” It could easily refer to Bennett, who was a member of the Security Cabinet during the operation. Even as the fighting was underway, he made a point of branding himself as the campaign’s political victor. He was the young minister who challenged the prime minister, the defense minister and the chief of staff, all of whom failed in their management of the fighting in Gaza. Bennett showed an unprecedented level of sophistication by shifting the public discourse about the operation to the threat posed by the Hamas attack tunnels. As the report shows, not only did he convince the public, he even managed to convince the state comptroller himself that the most important way to assess Operation Protective Edge should be through that prism. Bennett operated like a well-oiled PR machine in the month preceding the report’s release. Military and political pundits and senior media figures alike all received personal briefings from him. This prepared Bennett for the inevitable political fighting both preceding and following the report’s Feb. 28 release. Prime Minister Benjamin Netanyahu, Moshe Ya’alon, who was defense minister at the time of the fighting, and then-Chief of Staff Benny Gantz waged a media campaign of their own in an effort to undermine the state comptroller’s findings, which were very critical of them. Meanwhile, Bennett made some last-minute adjustments to his own efforts. In the days before the report’s release, he briefed the members of his faction about its findings and recruited them to continue with his political and media campaign — a campaign designed to intensify as the report would be published. In closed-door party meetings, Bennett could finally show his Knesset colleagues that he was “providing them with the goods,” as the head of a party with eyes on the prime minister’s office. On the night before the report was published, Bennett shared his version of events again, this time at a meeting with party activists. Bennett’s new status as the political beneficiary of the criticism surrounding Operation Protective Edge bolsters his standing within his party and among the right at large. When confronting Netanyahu and Ya’alon, his two main rivals for the leadership of the right, he can now present himself as a security hawk who has a better understanding of the threats posed by the campaign in Gaza. Along the way, he is also firing off a warning shot at an emerging political threat by challenging the professionalism of Gantz, someone frequently mentioned as a candidate for Labor Party leadership. The one person who tried, without much success, to shift the discussion about Operation Protective Edge away from the threat posed by the tunnels was former Justice Minister Tzipi Livni, who was also a member of the Cabinet at the time of the operation. As a former foreign minister, too, Livni is one of the most experienced politicians when it comes to serving as a Cabinet member during a military campaign. She was there for the Second Lebanon War in 2006 and for Operation Cast Lead in Gaza, 2008-2009. In a conversation with Al-Monitor on Feb. 27, Livni said that the most important conclusion to be derived from the way the Cabinet functioned during Operation Protective Edge is that Israel has no real policy regarding the Gaza Strip. That, she continued, should be the focus of discussion. In a stinging rebuff of Bennett, she noted that “during Operation Protective Edge, the Cabinet was busy dealing with tactics, rather than with strategy.” Livni said she tried spearheading an initiative that would successfully end the fighting and offer Israel achievements vis-a-vis Hamas. Her proposal called for the demilitarization of Gaza in exchange for its reconstruction and rehabilitation. The UN Security Council was prepared to accept her proposal, which would have given Israel license to take action against the tunnels and Hamas’ rocket fire against Israel. Nevertheless, she claimed, the prime minister blocked it. Another politician who served during the operation as a senior Cabinet minister also told Al-Monitor that Livni sought to divert the internal wars in the Cabinet to the diplomatic field. By focusing on tactical issues, the report succeeded in turning a public discussion about the hostilities into a political battle. That is unfortunate. The public received and continues to receive vast amounts of information, including conflicting versions of events and accounts of infighting in the media. What the report failed to provide is a focused discussion about serious issues, which is, in itself, a huge disservice to the families of the 73 soldiers and civilians who died during the operation. That is also why discussions surrounding the report are only accessible and meaningful to a very limited group of interested parties, those being the very people who pull the strings. The political impact of the report is much more limited in scope than Bennett would like to believe. It contains no operative conclusions regarding Netanyahu, Ya’alon or Gantz. Furthermore, those three principals actually find themselves on the same side, rather than squabbling with each other, while Livni isn’t attacking any of them from the opposition benches. In other words, the report will not have a corrosive effect, whether on the right or the left. In that sense, it is a sharp contrast to the Winograd Commission Report after the Second Lebanon War. Palestinian man on Wednesday succumbed to wounds sustained during an Israeli airstrike in Rafah city in the southern Gaza Strip in 2003. Local sources affirmed that Jamal Abu Ziyada, 30, died due to critical injuries he sustained during Israeli airstrikes over Gaza. Abu Ziyada had suffered paralysis as a result of the injury for long years before breathing his last this morning.